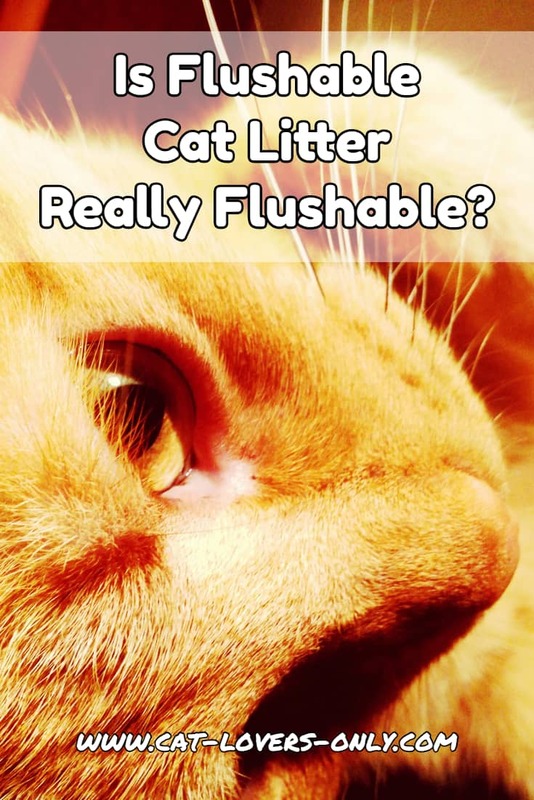 Is Flushable Cat Litter Really Flushable? Is Flushable Cat Litter a Good Green Option? Flushable cat litter is not widely used by house cat parents in the US. In fact, alternative cat litters in general aren't yet that popular, but the idea has been gaining popularity over the years. Concerns about the environment have paved the way for new green litter brands to hit the market. Judging by the discussions I've had with readers, topics in Facebook groups, and questions I've gotten, it would seem as though people are starting to warm up to the idea of using alternative cat litters. That usually means replacing clay litter with something else. Despite the marketing push for alternatives, the majority of cat litter in use today is still either clumping clay litter, made of bentonite, or the old style non-clumping clay litter. In fact, as discussed below, alternative cat litters don't seem to be gaining in popularity, despite what I hear on the streets. The market has spoken, and clay still rules the box, but clay has its detractors, and its problems. There are a number of environmental issues associated with the use of clay litter. This includes both the production of the litter (strip mining clay, for example), and the disposal of the litter and cat waste itself. The U.S. Geological Survey tells us that in 2015, 1.5 million metric tons of bentonite clay, the kind used in clumping clay litter, was sold or used. We can guess that most of that ended up in the landfill. For these and other reasons, some people want to move away from clay litters. Where environmental concerns are a factor, alternative litters are the obvious choice for consumers. Alternative litters are made of everything from silica gel (silica crystal cat litter), to old newspaper (Yesterday's News), to sawdust from pine (Feline Pine), to soybean and potato (Close to NatureNow), to grass (SmartCat). Many of these litters are absorbent, lightweight, claim to be dust and (almost) track-free, provide natural odor control, and appeal to an eco-friendly crowd. Some alternatives to clay litters are marketed as biodegradable, and some are supposed to be flushable (not all in the list above are). So, they seem good, at least on the surface, but are they really flushable? Are they even biodegradable? Can You Really Flush Flushable Cat Litter? On the surface, flushable cat litter seems like a good idea. After all, we send our human waste down the toilet all the time, so why not cat waste? 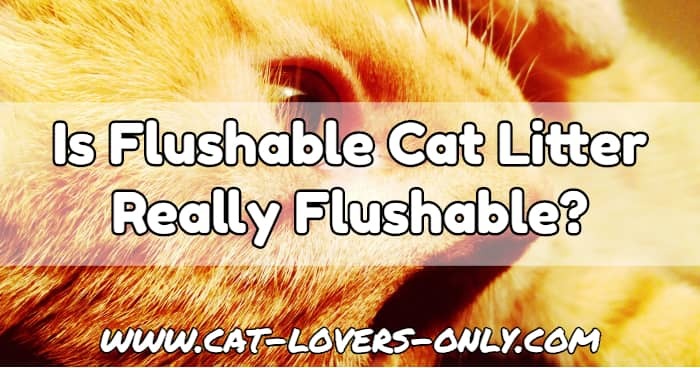 According to information online from plumbers, flushing cat litter (including flushable litter products) is probably going to make your plumber a lot of money. Depending on your plumbing and how much you flush, flushing any significant amount of cat litter of any kind down the toilet will probably result in clogged pipes at some point. Today’s water-saving toilets use only 1.6 gallons of water per flush. That’s not enough water to keep the kitty litter moving. That said, quite a few cat owners have reported using flushable cat litter for years without any apparent issues. Your mileage may vary. 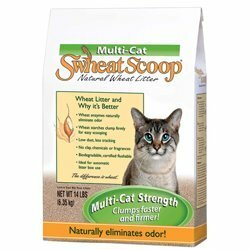 Note: Swheat Scoop Natural Wheat Litter claims to be the only litter on the market that’s certified flushable by the SGS U.S. Testing Company. It's made from wheat, which contains enzymes that neutralize litter box odor. Next, there are some environmental issues with flushing cat feces. First, waste treatment plants are not designed to handle Toxoplasma gondii (the parasite that causes toxoplasmosis and may reside in cat feces). Second, whatever you flush can end up in places you hadn't realized, such as bodies of water, such as the ocean. In California, for example, there have been concerns that T. gondii is hurting the sea otter population. As a result, any cat litter sold there has to contain a statement that discourages flushing. T. gondii can infect all warm blooded animals, and researchers have found it in dolphins and a humpback whale. So, while you can flush, there are reasons not to. Concerns related to flushing cat litter may be a little overblown, though. First, there is only a very small window of time where an infected cat sheds T. gondii. Second, the research on the effect on sea otters is not conclusive, with at least one study refuting the role pet cats play in infecting them. Still, for many who are environmentally conscious, better safe than sorry is the motto. For the most part, then, flushable cat litter really isn't flushable. Many people end up simply disposing of it the old fashioned way... in the garbage. Most of these alternative litters end up in the landfill right along with the clay litter. The difference, of course is that unlike clay, many of these litters are biodegradable, or at least that's how they're advertised. But that raises another question. Are the biodegradable claims of some of these companies realistic? Does flushable cat litter break down the way it's supposed to when disposed of in a landfill? Is Flushable Cat Litter Really Biodegradable? Mark Klaiman runs Pet Camp and Pet Camp Cat Safari in San Francisco, CA. Pet Camp is a unique, certified green boarding facility for cats and dogs. In this article on litter and the environment he elaborates on the environmental impact of producing and disposing of cat litter. One of the points he makes is that these "natural" kitty litter products might be biodegradable if you sprinkle them in your garden, but not if you put them in a plastic bag and send them off to the landfill. Even if you do use your used litter as mulch, you have to remove the feces and dispose of that separately. Klaiman also points out that composting may be possible, but San Francisco (and likely other areas) won't allow kitty litter or animal feces to be collected for this purpose. Some recommend you dispose of your used, biodegradable cat litter in a paper bag in the trash. This may allow the litter to degrade in the landfill. Based on your local trash collection policies, though, this may not be acceptable or allowed. If you're currently using clumping clay litter in the box, you might be wondering if you should switch. You might even be feeling some pressure to switch to an alternative. I'll have to leave it up to you to answer that question. I will say that switching litters can kick off litter box problems and end up being just an expensive experiment. So be prepared if you do switch. My intention here was not to go into all the details on the types of alternative litters, but only to address the flushable cat litter aspect. As I did more and more research on this subject, however, it became clear that the alternative litters have their problems. So while clay litters may have a reputation for impacting the environment, flushing just doesn't seem like a good option either. One of the reasons stated by a number of resources that clay litters are more popular is cost per pound. I would say also that clay simply works so well (in most cases) that most people might be reluctant to switch. For example, pellet type litters are either uncomfortable for sensitive paws, or perhaps simply don't feel right to the cat. Clay has that sandy feel that cats seem to like most, which can be important for initial litter box training or if your cat goes off the box at some point. What about you? What are your experiences with flushable cat litter? Have you tried it? You can buy a number of flushable cat litter brands at Amazon. Formerly known as Flushable Cat Litter, Better Way is clumping, flushable litter made from 100% Zeolite clay. World's Best is a corn-based favorite of many cat parents and claims to be 99% dust free, and septic safe. This is a non-clumping cat litter in pellet form, made from, you guessed it, pine (comes in a clumping version, too). Flushable in small amounts, ökocat makes natural wood litters that are biodegradable, clump, and have been certified by SGS. As the name implies, sWheat Scoop is 100% biodegradable litter made from naturally renewable wheat, and it clumps. Enzymes in the wheat are supposed to neutralize odor. Claiming to be dust-free and all-natural, CatSpot litter is made completely from coconut shells. Oddly, a company rep says you can flush the solid waste, but not the "bulk waste" where the urine has been absorbed. Weruva uses cute packaging and wording ("It's A Tea Potty!") for what they describe as an all-natural cat litter made from hinoki wood and green tea. It's clumping and flushable. Made from recycled wood and green tea powder, Next Gen All Natural Green Tea Leaves Clumping Cat Litter is flushable, compostable, and clumping. Cypress Fresh can be flushed "a few clumps at a time" or composted. It's another clumping cat litter made from hinoki wood and Green Tea. Hinoki is a species of cypress native to Japan, hence the name. Clumping and flushable, this biodegradable litter is made from plant-based natural ingredients. The company claims it has twice the absorbency of clay litter by volume, doesn't track, and is 99.9% dust free. "Natural Care Litter" is clumping litter made from corn cobs. Made from walnut shells, Blue Buffalo Naturally Fresh is "virtually dust-free" and "equal to three bags of the leading clay litter." Feline Fresh is a pellet-type litter made from 100% southern pine. It can be composted, used as mulch, or flushed. Rufus & Coco is a clumping litter made from corn that can be flushed or mulched. Only Natural Pet makes this grass seed litter with 100% USA, GMO-Free, farmed grass. Flushable and biodegradable, the company claims this litter is 99% dust and track-free. This Garfield Cat Litter formula has tiny grains so it's soft on paws. It's fast clumping, biodegradable, and flushable, and is a fan favorite. The manufacturer claims it is dust-free.